I’m always looking for ways to do things more efficiently and I thought I’d share some of my productivity ninja tips in a series of blog posts. Here’s the first! I use about a bajillion different web services in my teaching, and I pay for premium subscriptions to many of them. 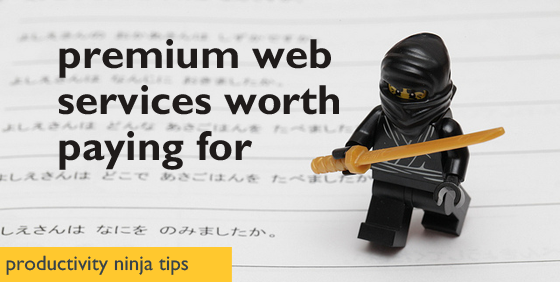 This post provides an overview of the services I have premium subscriptions for, how I use them, and why it’s worth going premium. We use Facebook groups for discussion forums and Buffer allows me to schedule posts to the groups in advance. It means I can schedule all the ‘what’s on this week’ posts, posts reminding about assignment due dates, and posts reminding students about my availability over the weekend when they have assessments due. I also schedule reminders about activities I want them to complete between classes. I also use Buffer to schedule tweets for my research group’s Twitter account and our Facebook page. Buffer basically allows me to plan ahead and means I don’t have to clutter my head or my to do list with reminders to make posts at key points. Buffer’s premium plan is called the Awesome plan and costs USD$10 a month. The Noun Project was my find of 2014. It’s a freaking awesome site where you can source Creative Commons licensed icons for use however you like. You just need to attribute the creator. If you don’t want to attribute an icon, you can buy it. I did this for an icon I use on my business card, for example. They also have NounPro accounts, which are essentially premium subscriptions. If you have a NounPro account, you don’t ever have to cite the icons. And when you make as many presentations as I do, that saves you a whole lotta time. When you’re a NounPro account holder, you also get a desktop app where you can search for icons and drag and drop them into whatever application you’re working in. Super handy. The only problem with the app is you can’t access your folders of favourite icons (which are called ‘kits’) from the app. But I can live with that. A NounPro account costs USD$99.90 per year. WPMU Dev is a premium WordPress support, plugin and theme service. I started subscribing to this service a few years back because I got sick of making my own WordPress tutorial videos for students in the unit where I host students’ blogs on a WordPress network. These guys provide unbranded help videos that you can use on your own site. But this is only one part of the service. They also make premium themes and plugins, and in particular, they make stuff that works with WordPress Multisite and BuddyPress. These make it much easier for me to manage my WordPress based course sites. Currently you can sign up for 12 months for USD$294. Earlier this year a small child entered my iPhone password incorrectly enough times that my phone had to be reset. And I lost everything, including video I’d shot for teaching materials. I immediately signed us all up for 200GB iCloud plans and all of our devices now sync to the cloud when they’re plugged in. 200GB of storage costs $4.99 a month. I have three different hosting accounts with three different providers. One is a shared server plan I’ve had for years, which costs about USD$80 a year. It’s fine, but I feel like a resource hog running a WordPress multisite network on a shared server, so I also have a virtual private server (VPS). The VPS costs USD$50 a month but I bump it up to the USD$100 a month plan during semester when I’m running a multisite WordPress network. I’m really unhappy with this VPS service and as soon as I’ve got time to move the sites that live there, I’ll be switching them to my new host, Reclaim Hosting. These guys are brilliant. Their plans for students are USD$25 a year including a free domain registration. I pay $45 for the faculty or organisation plan, which also includes a free domain. It has been brilliant. I cannot recommend them highly enough. Seriously, don’t pay for WordPress premium options at wordpress.com. Run your own install with a Reclaim shared hosting package. My life is in Dropbox and I quite seriously don’t know what I did without it. I have to have a premium plan because I need the extra capacity. Dropbox Pro costs $109 a year. I think everyone loves Doodle for scheduling meetings. The Premium version gives you calendar integration (unless your organisation prevents it, which mine does), plus the ability to send automatic reminders, see who hasn’t responded, and ask for additional information like email addresses from responders. Premium Doodle costs €39 a year. So this is not actually a premium service, but I always have some Skype credit available for times when I need to bring multiple people into a single phone conversation, or when I need to record a phone conversation. CudaSign is a tool for filling out and signing forms, and for getting them signed by other people. I actually use it mostly to sign my own forms, where I have to use the same form repeated times. The form is set up as a template, so I just have to put in a couple of details and add my signature. It’s much faster than printing, filling out the form, signing it, and scanning it back in. It costs US$1 a month per user and you really only need yourself on there as a user. Spotify is an essential productivity tool because I can’t work in silence. Spotify Premium gives you unlimited access to any content, any time, and you can listen offline. It costs $11.99 a month. What premium web service do you use and recommend?